Just as it’s a tradition on Doctor Who for different incarnations of The Doctor to bump into each other, Titan’s Doctor Who comics have also started an annual get-together for the various incarnations of everyone’s favorite Time Lord. 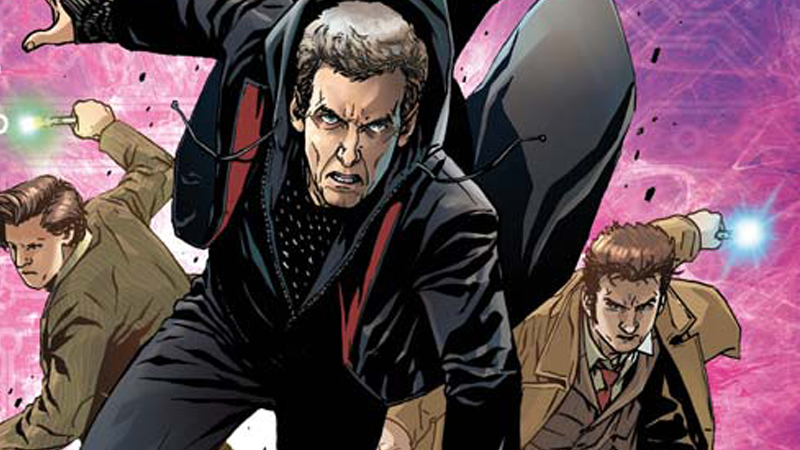 This year is a little different, though—because this time the Ninth Doctor gets to join in on the action. Last year’s excellent The Four Doctors featured a brief cameo for Christopher Eccleston’s Doctor, but now that he has his own ongoing comic he can join in on this year’s teamup between all four modern incarnations of The Doctor... and this time, they’re coming together to face one of their oldest and deadliest foes, the Cybermen. Written by George Mann and Cavan Scott, and with art from Alessandro Vitti, Titan and BBC Worldwide North America’s new event series “Supremacy of the Cybermen” will see the exiled former Time Lord President Rassilon captured by the Cybermen (who are celebrating their 50th birthday this year) and used to grant the cyborg hordes access to all of Time and Space. Past defeats become victories, meddling foes becoming willing allies to the Cyber-cause—and it’s going to take everything the Ninth, Tenth, Eleventh and Twelfth Doctors have to stop them from turning all of existence into Cybermen. Check out a few of the variant covers for the first issue in the five-part series below, making their debut here on io9. Doctor Who: The Supremacy of the Cybermen kicks off on July 6, just ahead of Titan’s annual celebration of Doctor Who Comics Day, taking place at comic stores on July 9—featuring signings and opportunities to meet the creatives behind the Doctor Who comics, there’ll also be a “blank” variant of the cover for art sketches and autographs available for the first issue, for readers to use during the celebrations.